The city that has been home to five North Dakota governors got its start as a windbreak. It was 1873, and the Northern Pacific Railway sent Mike Smith to plant cottonwood and willow trees in the area to serve as windbreaks along the railroad’s right-of-way. The idea was to harvest the trees and use them for railroad ties when the trees grew to maturity. As that experiment was growing, the one-man hamlet was called "The Nursery," "Goose Creek" and "Swan Creek" for a stream that meandered through the area. In 1874, Emil Priewe and his wife joined Smith there, and on March 28, 1875, their son, Harry, became the city’s first child when he was born in their sod shanty. In 1876, a school was organized for area children. That same year the railroad established a station there and called it Casstown after George Cass, the railroad president. 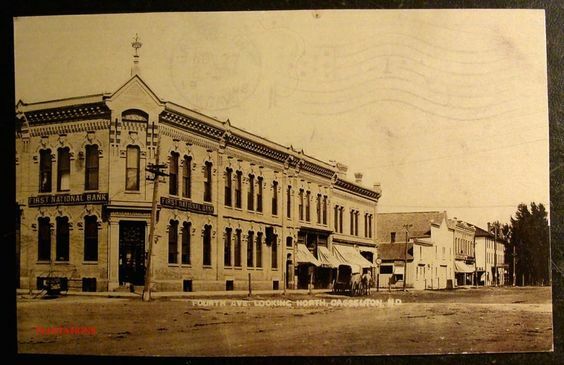 On Aug. 8, 1876, the spot was designated Casselton and a post office was established. When the town was incorporated as a village in 1880, the official census was 376. During the 1870s, George Cass and Peter Cheney had traded their railroad stock for 10,000 acres near Casselton and decided to develop the land as one large farm rather than dividing the land into small tracts. They employed Oliver Dalrymple, who was from southern Minnesota, to run the operation. The venture was highly successful and proved that the prairie was suitable for agriculture. Meanwhile, the community continued to grow, and by 1885 the population had reached 1,365. Like the Northern Pacific, the Great Northern Railway influenced Casselton’s growth significantly. Several branches radiated from the city, and the railroad excavated a reservoir to supply water for its steam engines. In 1906, the railroad constructed a roundhouse and service center, which operated in Casselton until 1920. In the 1920s, railroad personnel were transferred to other locations, and Casselton’s population fell by 285 people between 1920 and 1930. Casselton installed a city water and sewer system in the mid 1920s. Water was pumped from artesian wells and stored in a standpipe which was located on the east part of town. The standpipe was 110 feet tall and looked like a gigantic culvert and remained in place until 1956. In 1927, the city graveled the downtown roads, and in 1930, State Highway 18 through the city was paved as a Works Project Administration project. Following World War II, the city paved the business district streets with concrete. By 1957, the Great Northern Railroad no longer had a need for the Casselton reservoir, and deeded the 73 acres of land, which encompassed that body of water, to the City of Casselton. The city developed the reservoir as a municipal water supply until March 1978, when the city began obtaining water from the Leonard Phase of the Cass Water Users System. The reservoir area has since been developed into a recreational center with softball diamonds, picnic tables and other amenities. The 1996-1997 school year opened with a newly completed, nearly $8 million Central Cass Public School building. It replaced a three-story building on the same site that was dedicated in 1912 and cost $50,000. The school district covers nearly 400 square miles, and attracts more than 800 students. An addition to the school complex was completed in time for the 2003-2004 school year to handle continuing growth. In 2000, the U.S. census counted a little more than 1,800 residents in Casselton. That figure increased by about 25 percent by 2010, when our population had grown to more than 2,300.